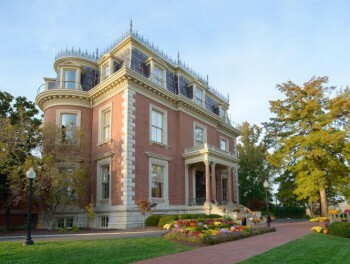 The Missouri Governor’s Mansion is located at 100 Madison Street in Jefferson City. Located on 10 acres overlooking the Missouri River and the State Capitol, it is the home of the Governor and is listed on the National Register of Historic Places. 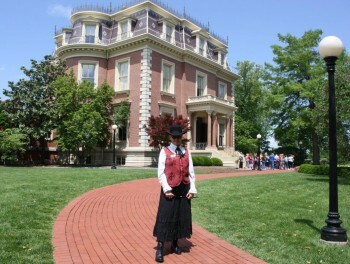 Visitors to the Missouri Governor’s Mansion are welcomed by a talented group of volunteers known as docents. Nearly 70 docents provide the public tour program and assist at special events throughout the year. Docents are trainers, educators, tour guides, researchers, public relations specialists and ambassadors for Jefferson City. They welcome more than 70,000 visitors annually and bring history alive at the home of the First Family. Please allow 30 minutes for a tour. Tours are divided into groups of 30 to ensure an enjoyable and educational experience. Tours are approximately twenty to thirty minutes in length. In the event Jefferson City schools are closed due to weather, tours will also be closed. 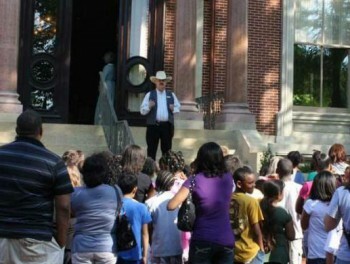 Due to the Governor’s Mansion being a working building, tours and events are subject to cancellation at anytime. Thank you for your patience and understanding. If you have any problems or questions feel free to call us at 573-230-7000. 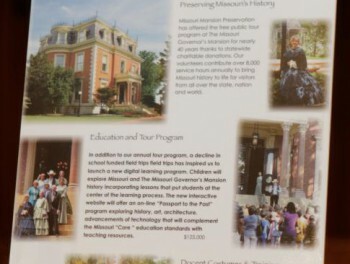 There is no charge to tour the Missouri Governor’s Mansion. Tours are requested by reservation; however, walk-in visitors (less than 10) are welcome without a reservation. 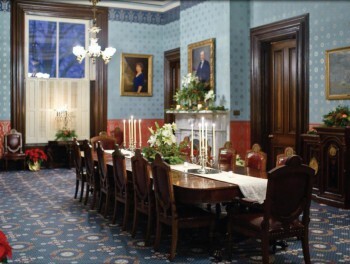 Groups of 10 are required to make a reservation by contacting www.missourimansion.com or by calling Friends of the Missouri Governor’s Mansion at 573-230-7000. **If you are making a reservation for a constituent group, please forward the tour confirmation to your tour group. Please note – during the busy spring season, walk-in visitors are included with existing tours as space permits. If you are unable to keep your scheduled tour, please call 573-230-7000 as soon as possible to cancel. It is important to begin tours promptly. Late arrivals will be accommodated as space permits, this may include a “walk-through” tour or rescheduled at a later time in the day when possible. Each tour group is divided into approximately 30 people to ensure an enjoyable and educational experience. Everyone who will be taking the tour must be included on the reservation, including children (17 and under), chaperones, and teachers. If a visitors has special needs that require accommodations, please indicate that when making the reservation. 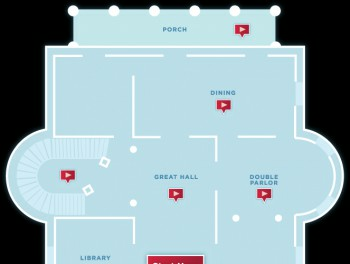 The Mansion has an elevator and ramp for guest mobility. Upon arrival, enter through the Madison Street gate for security personnel to assist you. For safety reasons, please do not allow anyone in your group to climb on the outside fence surrounding the Mansion grounds. Groups should remain as quiet as possible while on tours. They also should be encouraged to be attentive to the tour guides and to remain with the group throughout the tour so no one becomes lost or separated. Please turn cell phones off or to silent during tours. 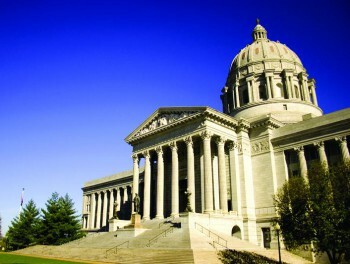 There are no public restrooms in the Missouri Governor’s Mansion. We recommend that groups use the restroom before visiting the Mansion. Public restrooms are available across the street at the Governor Office Building and the parking garage across the street, and the first floor of the Capitol Building. Visitors are welcome to take pictures with cameras but please refrain from flash photography. No video or audio recording is allowed during tours. 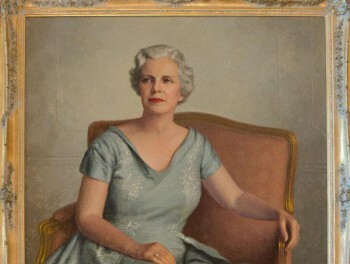 To help preserve the furnishings and interior of the Missouri Governor’s Mansion we ask that no packages (including backpacks), food, beverages (including water bottles) or chewing gum be brought into the Mansion. In the case of a scheduling conflict, Mansion staff will try to notify your group’s representative to reschedule your tour, and place a sign on the front gate to share the closure. If Jefferson City public schools are closed due to inclement weather, the Governor’s Mansion also will be closed. 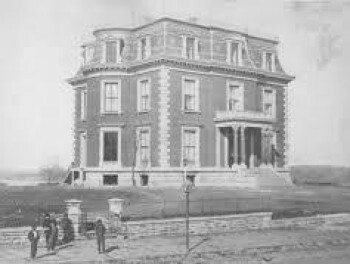 The Missouri Governor’s Mansion is located two blocks from the Capitol and Jefferson Landing State Historic Site. When scheduling tours at more than one site, please allow time in between tours to get from one site to the next. Please unload in front of the Governor’s Mansion at 100 Madison Street. Parking is available in the bus parking zone, which is located on State Street, across from the Union Pacific train depot at the end of Monroe Street.